Peter Gorman has been places. He’s been inside, outside, upside, downside, this side, that side, and the other side. In the words of Dennis McKenna; Peter Gorman has “been way, way beyond the chrysanthemum on many a dark jungle night.” And that’s putting it mildly. His new book Ayahuasca in My Blood: 25 Years of Medicine Dreaming, is brewed with an enchanting lucidity. To read it is to drink down a story, a whirlwind, a wild fire of spirits and curanderos, pirates and teachers, frogs and vines, snakes and shamanism, plants and visions woven across the arc of a quarter century’s worth of heavyweight Amazonian, Texan and New York City adventures. Written with the total recall of an expert investigative journalist, prepared with the special flair and flavors of a Master Chef, the book is spun lavishly, elegantly. Reading the book places you deep in the forest, late at night, around a small campfire, listening to a savvy bard recount terrifying ghost stories. Stories you might only barely admit to believing. Thing is, these stories, and the storyteller, are realer than real. Furthermore, the ghosts in these stories appear to you in sharp focus, they surround, they approach, touch, terrify, cajole and, they are ones holding lights up to their faces. Ayahuasca in My Blood articulates very clearly Gorman’s relationship with the realms of the “way, way beyond”. It must be said, however, that Peter has also been, and remains, very down-to-earth. The heart of the book concerns Peter’s extraordinary experiences with ayahuasca. However, his struggles with his family, his work, his truck, his ranch in Texas, his life in NYC and his old bar in Iquitos all play major roles in an intense narrative that manages to include magnificent, informal biographies of three of his most important and respected teachers; Moises Torres Vienna, an ex-military man who first takes Gorman out into the deep green, imparting lessons in survival; Pablo, the powerful Matses headman who introduced Peter to sapo—the now legendary frog venom medicine; and of course the story of the humble and potent curandero, Don Julio Jerena. Ayahuasca books are bursting forth like wildflowers, yet rare is it to find one’s self SCUBA diving through the veins of someone who’s traversed this terrain as long, deep and freaky as Gorman has. Try as I might to avoid presumptions, or pull cliches, it must be said that Ayahuasca in My Blood is destined to become a classic. In fact it’s already there. More than that, it’s a valuable reflection on the nature of shamanism, a reflection that has not, to my knowledge, ever been illuminated in such a visceral way. If one considers the spectrum of related literature—take for example William S. Burroughs’ The Yajé Letters, Terence McKenna’s True Hallucinations, Wade Davis’ One River, Jimmy Weiskopf’s Yajé: The New Purgatory, or Steve Beyer’s Singing to the Plants—Peter Gorman’s Ayahuasca in My Blood weighs in amongst these giants and, in many ways, ties them all together. Like Gorman, William S. Burroughs stumbled into the role of being a precedent setting, right-place-at-the-right-time gringo drawn to the jungle and its medicines long before most of the world even caught a whisper of anything to do with ayahuasca. Terence McKenna went very, very deep and utterly lived (and loved) to tell the tale, however tall and unlikely it may have seemed to be. Wade Davis, the gifted writer and explorer, wove together a story of the jungle, plants, and his friends and mentors Richard Evans Schultes and Tim Plowman. Jimmy Weiskopf courageously detailed his own hell, transformation and learning, and Steve Beyer simply laid it all out in one fell swoop. Ayahuasca in My Blood is a mix of all of the above. What distinguishes the book is in part due to Gorman’s style as a writer, he’s most certainly and abundantly endowed with the Irish gift of gab, and a memory of unparalleled clarity. However, perhaps more importantly, is in how this book casts, with tremendous verve, the doors of perception wide open, busting them off their hinges, sending them flying into the deepest void you care to imagine, where a great wind sweeps you clean off your feet, rockets you head over heels into a whole other ballgame, brings you back to reality, momentarily, then threatens you, teases you, provokes, challenges and simply never lets up until you find yourself dropped, like some kind of jungle-fied Dorothy, breathless, in the eye of a poltergeist tornado, with a snake in your stomach and bills to pay. There are very few people alive who have 25 or more years experience with ayahuasca, most of them are the old mestizo and indigenous shamans of South America. Rarer still are those among this experienced group who are willing and able to write about their experiences. Peter Gorman, in opening his heart, his life and his talents, shares a masterwork in this respect; a tremendously earthy, rich, poetic, way-out and honestly magical artifact, gathered from the deepest of depths. MORGAN MAHER: What first brought you to the Amazon jungle? PETER GORMAN: I always loved travelling. Starting in high school I began to hitchhike, eventually crossing the U.S. several times and logging about 50,000 miles on my thumb. Feeling like I’d seen a good deal of the U.S., I headed out to Europe and then on to Mexico for a few months. In Mexico I fell in love with the Lacandon jungle in Chiapas. I’d have gone back but the woman I lived with bought me a book on my return called Headhunters of the Amazon, by a fellow named Up de Graf. I think it was published in 1923, but it dealt with his time in the Ecuadorian and Peruvian Amazon from about 1896-1906 or something like that. Large sections of the book took place on the Yavari River, the border between Brazil and Peru. He painted it as a wild place, a no man’s land. So I decided to go see that river. The nearest jumping off point was Iquitos, Peru, and so that’s where I went in 1984 with a couple of pals. I returned in 1985 to do a month of jungle survival training with a fantastic guide and teacher, Moises Torres Vienna. I didn’t get to the Yavari right away, but did get there in 1986, and in 1988 spent some weeks there. A couple of years later I was able to secure my own boat and run the length of that river. It was as wild when I reached it as it sounded like it was for Up de Graf. Much of the book, and your experiences in the jungle, is inspired and connected to your friend and teacher Don Julio Jerena. Could you tell us about Julio? Julio…hmmm. Well, he was the local curandero—healer—on the Aucayacu River, about 212 km south of Iquitos, not far from the river town of Genero Herrera. I first met him in 1985, when Moises took me out that way. He was small, strong, handsome. He had a bright smile and ears that were too big for his head. But he had a light in his eyes that I’d rarely seen. He was impish, full of fun, and an amazing healer. He was also the father of a pretty huge brood: I know nine of his children—the youngest born when he was 70—and I’m told there are a few I’ve never met. In real life, he supported his family with his military pension, which was several hundred dollars a month because he’d been in action in two wars as a young man, and as a fisherman. He was the simplest of men. He loved living on his little river, loved his small fields of yuca and sugarcane, corn and plantains. He loved his boiled fish and plantains. He loved to laugh. He was elegantly humble. But he was also a man of immense power. When he walked in the jungle he didn’t slash at the underbrush, he sort of waved at it with his machete as though the suggestion that the vines part was enough to get the vines to part. And most of the time it almost seemed as that were true. He healed with a wonderful touch, using ayahuasca to connect with the spirits—the sentient side—of the plants he’d need to utilize to heal a wide variety of ailments. Over the years I saw him work on snakebites, sick children, cancer patients (that one was one of my guests, and she got several more years than she thought she would), fungal infections, parasites—a host of things a lot of medical doctors would have a tough time healing. And he loved doing that. What lessons did he impart upon you? How to laugh when kids are driving you up the wall. How to apply patience to jobs to get the work done. To realize that the spirit of ayahuasca and the spirits of the other plants, and the guardian spirits are the doctors and that if we’re lucky enough to get the chance to heal someone sometimes to never believe that we are the doctors. To understand that this world, this universe and the other realities are all connected and that we have the ability to connect with it all. What lessons, or what kinds of lessons, have the plants taught, or continue to teach you? That’s not easy to answer. I am just whoever I am. I’m a dad, a journalist, a guy trying to put good healthy food on the table. Someone who has cats and dogs and chickens and ducks and birds and a goat and who tries to remember to feed them all before I feed myself. Would I be who I am if I’d never gone to the Amazon? If I’d never had ayahuasca? I don’t know. I would still be me, but I’d be a different me. But what part of that can I compartmentalize to say “Oh, that’s the ayahuasca?” versus just plain “Oh, that’s the experience of living, of raising kids” or whatnot? A great deal of the work that ayahuasca and other plants have done on me, I think, relates to my heart. To the ability to love freely, knowing there’s no shortage of what you can give. To forgive freely, knowing that holding the anger or pain is only going to make you sick and will do no one any good. I think I also understand the first inkling of healing others. Not that that’s something I can do, like a trick. But when my mother-in-law was dying, the plants let me put my hands on her back and absorb the heat her body was putting out. They allowed me to take it and eliminate it so that she could sleep. It blistered my hands but gave her rest. There’s really a great deal of learning that’s gone on. It’s the compartmentalizing that’s difficult to do. In other words, I think I’m a better person than I might have otherwise turned out, but when I look in the mirror I see that I’m still full of flaws. An important person in your life, and in the book, is your jungle teacher Moises Torres Vienna. Could you tell us about Moises. Like Julio, Moises was one of three extraordinary teachers I have had as an adult. Four if you include my ex, who taught me an immense amount about the jungle she grew up in. But the three were different. I met Moises with my two pals on my first trip to Peru. We’d seen Cuzco and Machu Picchu and hiked in the Cordillera Blanca near Huaraz and had finally gotten down to the jungle in Iquitos, where I was instantly at home. On our first day there, Moises, a ruggedly handsome former trainer of jungle forces for both the Peruvian and American military, was by then retired and a guide. He approached my friends and I on the street in Iquitos and asked if we wanted a guide. I was so tired of people saying they were guides by that time that I blew him off. I told my friends we should just catch a big riverboat somewhere and we’d wind up in a jungle town and find a real guide there, rather than use this smarmy little guy. So we did. We took a boat that took us to a little town—at that time—called Requena on the Ucayali River, headwater for the Amazon. It was a fascinating place. But difficult for gringos, which it didn’t get many of. For a hotel we had to take a place where wood partitions ran halfway up the wall and were topped by wire mesh. The guy downstairs kept a burro that brayed all day and night. We were followed by maybe 100 people everywhere we went—which was up and down the single street of the place. No one could change US money, and nobody had food prepared in restaurants. When you came in and ordered, they went out to try to buy a chicken for your meal. And nobody would take us into the jungle. They were all afraid of ghosts, Indians and jaguars. People went out as far as their chacras, fields, maybe 1000 yards behind the main street but that was pretty much it. Nobody we met in the nine days we spent there would even consider stepping into the canopy behind the last field. We spent the nine days in that crazy little place—which has grown up a great deal in the last 26 years—because the water was low that time of year and no riverboats coming from further up the river at Pucallpa could navigate. A couple of days of rain raised the river sufficiently though, and just about the time we were acclimating to Requena, we were out of Peruvian money and had to return to Iquitos. Shortly after we returned to our little hotel—I always took a single room so that I could make trip notes—there was a knock on the door of Larry and Chuck’s room. It was Moises. The guys got me and Moises asked how things had gone. I told him they’d gone great. He laughed. He said he knew we hadn’t gone to the jungle because nobody in Requena went to the jungle. They were all too afraid. But he would take us to the jungle if we liked. Full jungle was how he put it. Then he added the word “ayahuasca?” which none of us had ever heard of. He explained it was an hallucinogen that was a powerful traditional medicine. We could try it during our time in the full jungle if we liked. That was a new take. A Peruvian guide turning down a gringo’s money? When he returned that evening with a pair of size 10 leather workboots, I was sold. Over the years we became great friends. He’d take me out on long hikes, teach me jungle survival—like what vines to drink from and which would kill you—how to figure out if a food was good to eat or poisonous, how to build shelters, set traps, avoid snakes or kill them if you had to, brought me to the Matses, helped me put together my first boat for a 30 day trip on the Yavari. He was patient with a lousy student, made certain his lessons were well learned, was tireless at the end of long hiking days when I was too beat to get a fire and food going, and never forgot to bring extra coffee and a couple of spare packs of smokes for me. And he laughed the whole time doing it. Just a wonderful teacher. Another element of your experiences in the Amazon concerns your friendship with the Matsés. Could you speak a bit about the Matsés, and perhaps about Pablo in particular? Now you’re on to the third of my three extraordinary teachers, Pablo, the curaka. Pablo, like Julio and Moises, had this fantastic light in his eyes. All three looked like they were chuckling on the inside, enjoying every minute of living, despite all three of them living in the physically difficult Amazon. Moises and I ran into some Matses on the Aucayako in 1985. A year later I went to one of the rivers they have traditionally lived on, the Galvez River, which drains into the Yavari. We spent about a month on the river on that trip, moving from camp to camp—there were six camps of Matses at that time up there. Pablo’s was the smallest: Just he and his four wives and his friend Alberto and his two wives, and their kids. Maybe 20 kids all told, though I later met a number of Pablo’s older kids and in all he probably had 30. Moises and Pablo had history. In 1970 or 1971, Pablo had been a young Matses among a band that had raided the city of Genaro Herrera. They stole machetes and axe heads, several women and two young longhaired Franciscan Friars or monks. They later killed the latter, probably when they discovered they weren’t women. Meeting Pablo was no disappointment. He took me hunting, showed me medicinal plants, gave me my first dose of sapo—frog sweat—and laughed when I was writhing in pain on the ground. He talked with plants and animals and swore they talked back. He’d blow nu-nu, a tobacco and macambo snuff, at the clouds to keep it from raining and damned if it might not be raining all around the little camp but not in it. He really was one of the last of the “antiguas”, the old timers who knew the old ways of the Matses, and those ways involved deep interaction with the jungle in ways that seem mysterious and magic to those of us who witness them but don’t understand them. For medicines, it seemed—and I knew Pablo over a 20 year period, maybe eight long visits in all—like every plant was a cure. If it wasn’t a cure it provided food or shelter or the material to make hammocks with. He’d use plant medicines like nu-nu to see where to hunt the following day—and he had to hunt well to feed all those wives and kids. He shared everything with me, even tried to get me to go on a raid to a distant village to rob some champi—young girls so that I could have a couple of wives. That was the only adventure on which I turned him down. He’s the man responsible for the medical breakthroughs now being made using the peptides from his sapo frog—which turned out, when I was able to bring it out of the jungle—to be the phylomedusa bicolor, the giant monkey tree frog. And because of his work—primarily—on plant collecting with me for Shaman Pharmaceuticals in the early 1990s, he’s the reason that all of the Matses are now the only tribal group in all of Peru that now has permanently demarked land along with air, water and mineral rights. That was something Shaman arranged after the second of my very successful medicinal plant collecting trips on the Yavari and Galvez rivers. My trips, but it was Pablo and a couple of others at different camps, who produced the goods for Shaman. I was just the conduit. I’ve written a lot about Pablo and plant collecting, and someday I would like to just write about Pablo the person. He was just an hilarious character top to bottom. How has your life changed over the course of more than 25 years learning and working with ayahuasca? Well, now that you’ve gotten me talking about my three great human teachers, I will add ayahuasca as my great plant-spirit teacher. My life changed? Don’t know because it’s the only life I’ve had. And that includes those guys, that jungle, those rivers, the sounds, the shapes, the food, the rain, the crossing of log bridges… and ayahuasca is a big part of that. But my life also includes being an investigative journalist, a dad, a brother, a plumber when the sink gets clogged, and everything else that goes into living. For me, it’s just a life. Ayahuasca and the jungle are not separate, have not been separate from my normal life since I met them. Sometimes I’m in the U.S, sometimes in the jungle, but it’s all one life. I really think that ayahuasca, more than anything, has shown me in a very real and concrete way, that things like personal guardians exist, that everything is sentient and must be respected on equal value with everything else. I mean the old coffee grinds as well as the tallest tree, as well as that fly that’s buzzing around you incessantly. It’s showed me the value of life in a way I was taught but didn’t understand. It’s allowed me to see the other realms, to even sometimes operate in them to affect changes in this realm. It’s filled me with wonderment about every single day. I wake up wondering what’s going to be shown to me every morning and I love that. I might have done that without my three teachers and ayahuasca, but I’m not sure. I do know that I used to push love away, thinking somehow I wasn’t good enough or worthy, and that in the last 10 years I’ve learned to say “give it here! Gimme what you got!” and to give it away freely as well. That’s one place where I think the change in me is noticeable. To me at least. In what ways has your experience and relationship with ayahuasca affected your day-to-day life? Well, I like that I can fly now, And having superstrength is a gas….kidding. Ayahuasca is part of my day to day life, so I don’t know, beyond what I’ve said about giving and receiving love, how else it’s changed things. The spirits in general, have been helpful: they’ll sometimes tell me what plants a person needs to use to rid themselves of a physical ailment, or get in my face if I start overreacting to the kids and bring out the dad voice too quickly. They remind me when I’ve had too much to drink and think I can drive just to the corner….and then they’ll make the keys disappear if I try to ignore them. And I am very glad they do those things. I’m very appreciative. Your book is filled with amazingly detailed descriptions of your ayahuasca visions. Perhaps they could even be described as experiences, in that you tend to go far beyond what may be commonly associated as “ayahuasca visions”. For example you describe going to “The red room. The place where the healing happens”, or the market “where you get the medicines” or Joe’s Café. What do these kinds of places mean to you, and how have they changed your perception reality? Those places are real places. Something to remember is that our human brain needs to compartmentalize things. Since we’re not brought up dealing with spirits on a day-to-day basis, when we run into one, we tend to give it a human or monstrous shape—a shape it might not have at all. But our brain needs to be able to process things so we give those spirits a shape, a name, a visual we can deal with so our brain won’t explode from not knowing how to process the information. Now the “red room” is how I see a particular place. That place is an unmeasurably large cavern where all of the pain and suffering, all of the rotten deeds and selfish acts go. And in that place there are spirits who know how to transform that pain and horror into something positive so it can be let out into our world again without hurting anyone anymore. So when I’m called on to take someone’s pain or grief or whatnot, I don’t want to just keep it or it’ll stay with me. So having been shown the red room—and someone else’s brain would have them perceive it entirely differently—I know that’s the perfect place to put that awful stuff I’ve taken out of somebody. So to me it’s a place of transformation for rotten, pain and anguish causing feelings and suffering that’s very accessible in real life terms. I just open the door—which happens to be right next to me when I need it—and ask those spirits to take that junk and transform it into something good. The market to get the medicines is another interesting place. I’m not someone who knows all the plants—heck I probably know less than the average person. Still, I’m sometimes asked to come up with a remedy for someone. And the guardians—call them guardian angels if that’s more comfortable, though they don’t look like classic angels to me—know that, so they very nicely introduced me to a market filled with plants. And when someone needs something, I go to that market—no, you can’t see it, it’s only in my perception the way it is—and shout out the name of the illness or problem that needs fixing. And the plants are so freaking generous they just sometimes shout out the name or names of those that I’ll need. And then I’ll write them down and relay the information. Ridiculous on the face of it, and I’ll probably be sent to the looney bin for even suggesting what I’ve just said. Still, even when I’m given a plant name I’ve never heard of, I can usually find it on the net and because the plants are so generous, the use of the plant is generally spot on for what needs healing. Joe’s Café is another spot. Just a little café where you get to see things not normally visible to the human eye. It’s not around all the time, just when I need it. Now, the most important thing to remember with all these places, these gifts, is that I’ve been warned they can’t be used selfishly. I couldn’t go to Joe’s Café and see who is going to win a ball game tomorrow night. If I did and then bet on the outcome, I’m sure I’d lose, and not only that, I’d probably never be allowed to go to the café again. Also important to remember is that while this stuff is crazy, it’s not. It’s just accessing other realities that exist but move at maybe a different vibratory speed than the reality in which we exists does. And facilitating access to those realities are what the plant teachers like Ayahuasca and San Pedro and Peyote do. The codicil—if that’s the right word—is that once you’ve opened the door to those realities, once you’ve broadened the bandwidth of your sight to see those realities or experience them, you probably won’t be able to fully close that door again. And that’s pretty frightening to some people. I mean, to say there are ghosts is one thing. To have them waking you at 3 AM while they clomp around the kitchen is quite another. A simple sense that this could be a wonderful world if we’d all just pitch in and make it one. In journalism my work involves trying to expose rotten and vile things so that we can see them for what they are and eliminate them. Sometimes that means exposing the horror the war on drugs creates—from politically/financially motivated private prisons to mandatory sentencing laws to property forfeiture, to keeping hemp illegal when it might do so much good if its status was changed. Other times I’m motivated because I see the poor getting shafted in a million ways, or how the U.S. can manipulate politics around the globe to ensure benefit to private companies at the expense of whole populations. Those things motivate me and they become my guide posts as well. I’m not going to fix this damned world, but I am damned sure allowed to keep trying in my own way. Then there are my jungle groups, where I take guests out into the deep green and have them experience the jungle and ayahuasca in a pretty traditional setting. So many of those guests are so ripe for change, so hoping to change their lives—even if they don’t know it—that those trips often are just the thing they needed to either find a new direction in their lives or to give them the courage to deal with their lives in a more positive way. Those people, already good people, mostly just need a little polishing after life has kicked them around some. And I love being able to put them in touch with the things that can polish them up. Cause that makes a better world too. My kids, my friends, the under-served, underprivileged, the folks getting the short end of things. And my ex-wife’s new babies. And my granddaughter. And the dog and cats and everything else we take care of. What’s important to me is to keep looking at life like a new thing. To keep working to get the same gleam in my eye over living that Julio, Moises and Pablo always did. What is the most frightening thing you’ve encountered? My own selfish behaviour. Watching and being forced to relive some of the stupid, selfish things I’ve done over and over before Ayahuasca will let me vomit them out. The spirits can be demanding and they can be very very frightening, but in the end it’s my own negativity, my own failures, my own stupidity, my own self-centeredness that provokes the greatest fear. And when the medicine tells me we’re going to be working on something related to that on a given night, well, many times I have tried my best to run away from the experience out of sheer terror. You’ve experienced many different peoples, plants and places. What is it about the Amazon and ayahuasca that continues to captivate you so? In all my time in Peru, both as a guest and when I lived there and ran my bar, I have never once gone to sleep without having learned something new. That is a very amazing thing to be able to say. And that is something that keeps the Amazon, the jungle, the rivers, the medicine fresh. It just thrills me to be there. Of course, there’s a lot about it I don’t like. I don’t like the noise of the motorcars, I don’t like the dust in the air and the diesel fuel smells in Iquitos. I can get bored when I have done my work for the day—and when I get bored I want a drink to get a party going, and that’s led to some hilarious and not so hilarious events over the years. But overall, something still happens every day, and I mean every day, that makes me look at the world with just a slightly different pair of eyes when I go to bed than I had when I woke up. That’s a pretty irresistible lure for me. I’ve asked this kind of question before, and I know you’re a fantastic chef so I’ll ask you, too; You’re out in the jungle, you’ve packed some fruit and vegetables with you and some supplies. You’re hungry, you’ve got a few of your team with you, some of them just returned from hunting, others from fishing. It’s a beautiful day and you’ve all worked very hard. What are you going to cook up? Well, I’m not much on most jungle meats—I’m just not big on monkeys and sloths and such—but if my guys happened to come on a majas, a large jungle rodent, well, for sure we’re gonna roast some of that. It’s one of the few animals in the jungle that has fat on it, and when that fat starts to drip into the flames, well….. If the guys fishing happened to bring back a couple of fat piranha’s, well, put those guys on the grill and toss a bit of vinegar on them, and some wild cilantro if we can find some. Piranha are some of the best eating fish in the world. For fruits, I can always go for a thick slice of jungle papaya with lime juice and a bit of salt. For starch, I’d try to find a couple of yuca roots. Just boil them simply is good by me, or, if you’ve got a bit of oil, sauté them babies. For veggies, let’s do a stir fry with ginger, cabbage, cauliflower, green beans, tomatoes, spinach and whatever else we’ve got or can find. If we have some Ucayali beans—kind of like a pinto bean that comes from the Amazon–with us and we were smart enough to start them early, well, we’d have a little oil with lots of garlic and onion—or onion grass if we don’t have onions—in the pot. When that was just right, I’d fill the pot with water, add the beans when it’s boiling, toss in several diced tomatoes and some acholte or cumin other local spice. And four hours later, when the beans were ready, I’d finish it off with fresh cilantro. If we don’t have any, I’d put some Yerba Louisa, lemon grass, in to give it that final bite. That sounds like a pretty good meal to me, even if nobody has any majas or cayman tail or piranha. Your book is fecund, and flowing with amazing stories and experiences. Any stories that you would have loved to fit in, but somehow couldn’t? Anything left untold? There are a lifetime of stories not in the book. The book concentrates on ayahuasca and my relationship with it. There is some jungle, some damned good adventure, some love, some loss, victories and defeats, but it’s primarily about ayahuasca’s relation to all of that. Each of the two plant collecting trips in my own boats from Iquitos to Leticia to Angamos and up the Galvez—30-plus day trips after the month of finding and rebuilding the old boats I used—could be it’s own book. Trips up the Rio Napo are not even mentioned. A hike from Tamishacu to the Rio Midi is passed over. That was a good one. It was my first time, real time spent on the Yavari River. Moises and I hiked maybe four days to a little town on the Rio Midi, which lets out into the Yavari. Our plan was to make a balsa raft and float to the Yavari and from there, float down to Leticia in Colombia, where we would catch a boat down to Iquitos. Problem was, the river was too low for that. Also, there was very little balsa available. We arrived in the little town just as they were starting a 3-day celebration of Peru’s Independence from Spain. That was quite a party. People came from all over that part of the jungle to dance, sing, drink and feast nonstop. You’d be given a huge gourd of fermented masato, maybe a quart, and drink it down till it was finished. Everyone would cheer. Then they’d give you another, and another. So you had to vomit out what you drank to make room for more. So everybody was vomiting, and drinking and vomiting….most wonderfully hilarious party I ever attended. And this was good masato—the yuca had been properly chewed and spit out by the women, helping it ferment and giving it just the right texture. Bit of an acquired taste. At the end of the party, with no raft, we convinced one of the partygoers to take us down to the Yavari and then down to Leticia. The problem was, he had little gas. Just about enough for the few hours it would take his little 15 Hp motor to the mouth of the Midi. Moises was certain that once we got there we could get gasoline to continue the trip. Well, we went from one little shack—they were pretty well spread out—to another on our first day on the Yavari and came up empty. We had to paddle with one oar as that’s all the man had, most of that day. And that night we got stuck in a very slow whirlpool that simply spun us around and around all night long. We all woke up sick from the spinning. On the second day, Moises changed tact. He ordered me to carry our shotgun, and he’d approach a little hut owned by some fisherman and I’ve have to point that shotgun in the general direction of someone and he’d demand whatever gas they had. Now most everybody out there had a half a gallon of gas stashed somewhere, so we spent days going half-gallon by half-gallon, essentially stealing everybody’s gas on the river. We promised we’d return it when the boatman came back upriver, but nobody believed us. So there we were, stealing gas, and our boatman was sure we were gonna leave him stranded in Leticia with no gas for himself and no gas to pay back to people, so he was afraid he was going to get killed when he returned home. He wasn’t. We were good for our word. In the Brazilian town of Benjamin Constant, right next to Leticia, we stopped at a floating service station and I bought—on credit—two 55 gallon drums of gasoline. The boatman got one for his work, and everybody else was to get double what we took from them at shotgun point. It wound up working out fine, and everybody remembered me as a good guy when I returned to them in my own boat a couple of years later. We just laughed about it over masato. There was also no room, or place in the book, for a recent story when I came on an illegal logging operation and some of my team and I, at my direction, cut all the logs in the log raft loose and floated them down to a large lake where they dispersed everywhere. My hope was that the logger would have to spend enough time regathering them that he’d lose his profit and decide not to illegally log anymore, at least on that river. And there was very little room in the book for talking about being the only gringo in a place like Iquitos to run a bar. And one that was on an old port on the roughest corner in town. There were a million stories out of that place, and I think people still talk about The Cold Beer Blues Bar down there, even when I’m not around. I probably still get 30 emails a year from strangers asking where it is. And it’s been closed for almost 10 years. And the markets, and having an extended family, and getting friends out of jail and run ins with DEA types and military guys and getting bitten by piranas and flesh eating spider bites and having to do nearly a whole trip on a broken ankle and having an intestine explode in the middle of a trip and what it’s like to hang around the docks in the third world, or fly in little Cessna’s without any instrumentation over that vast forest, or collecting artifacts for the Museum of Natural History in New York, running into huge boas, having a boat of mine attacked by black cayman … there are lots of things in the book, and I hope it’s a great read and all that, but there’s lots more to tell. It’s been one heck of a life. 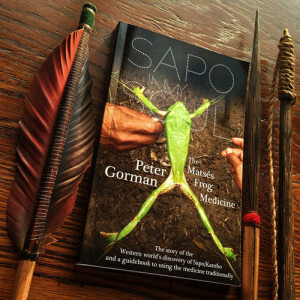 Peter Gorman’s Ayahuasca in My Blood: 25 Years of Medicine Dreaming is available now in hardcover, paperback and ebook.